It was 1973, and Jeff Stone, a sophomore at Northeastern, was sitting on the fence out front of his parents’ house just past the three-mile mark, when 65-year-old Johnny Kelley, two-time winner, seven-time bridesmaid and long the crag-faced symbol of Boston’s annual rite, stumbled through the gate and into his front yard. Stone caught him as he fell. A calf-muscle pull had forced Kelley, in his 42nd Boston, to stop four times in the first mile. Johnny later called it “the old Kelley luck.” Rubbing a stranger’s leg was Stone’s dream. He had been working as a trainer since his days at Ashland High and would go on to work at local events and colleges, including Suffolk. He laid Kelley facedown in the grass. Within six minutes the old runner was on his feet and gone. He didn’t stop once the rest of the race. “I wish to thank you very much! !” Kelley wrote Stone two weeks later. Stone, 60, has been working the marathon ever since. 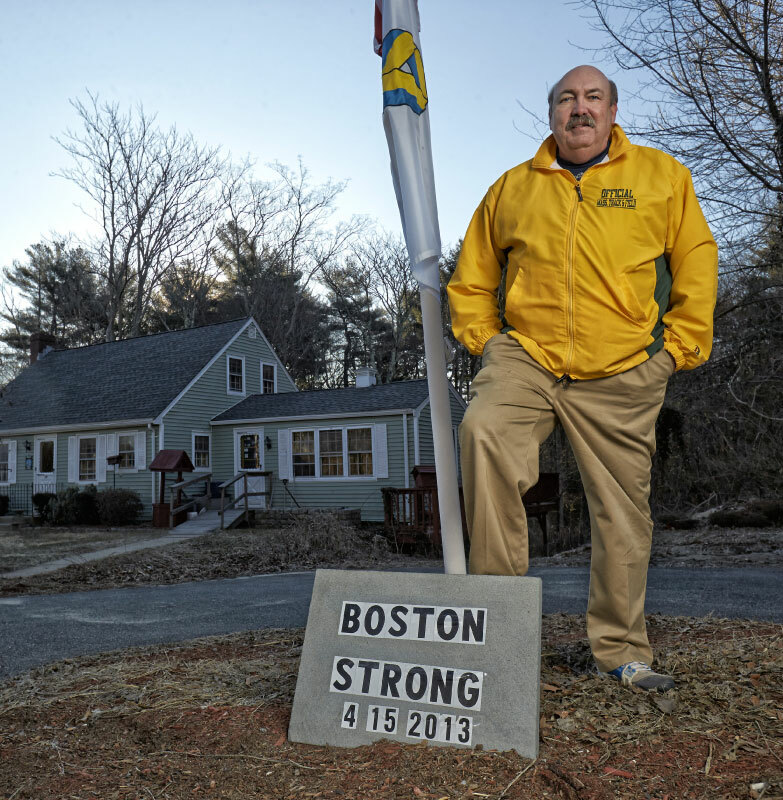 A decade ago he planted a 15-foot-tall white flagpole on a spot abutting the course, where he hangs American and Olympic flags on race day. Last year, after hearing the news, he wandered outside alone, as dusk settled, and lowered the flags to half-staff. He left them dangling for more than a week. It seemed the least he could do.